The latest installment of Thomas Siddell's adventurous fantasy series may just have another number in its title, but that won't stop it from being awesome. 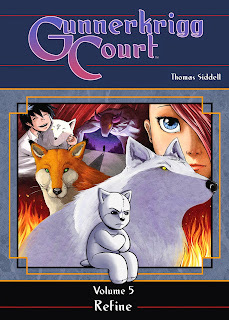 In fact, this June's release of Gunnerkrigg Court Vol. 5: Refine hardcover offers even more opportunity for readers to heap praise upon the work. The collection is the latest to follow the adventures of Antimony Carver at the mysterious boarding school, Gunnerkrigg Court. Antimony’s new responsibilities thrust her into the heart of the forest, taking Parley and Smitty along for the ride! Meanwhile, Kat is left to deal with the mysterious letter she received, and Renard takes the time to reflect on his past decisions. As the year reaches a close, some friendships will grow stronger and some will have to come to an end. The Gunnerkrigg Court Vol. 5: Refine hardcover arrives in comic book shops on June 17th with a cover by series creator Siddell for the price of $26.99 under Diamond Code APR151222. The Final Order Cutoff date for comics retailers is May 25th. Full press release below. May 20, 2015 - Los Angeles, CA - Archaia, an imprint of award-winning publisher BOOM! Studios, is pleased to announce the latest installment of Thomas Siddell’s adventurous fantasy series with the June release of the Gunnerkrigg Court Vol. 5: Refine hardcover. Siddell’s long-running webcomic has garnered high praise and a large fanbase from around the world, including legendary creator Neil Gaiman, and Archaia is pleased to present this collection of the latest adventures of Antimony Carver at the mysterious boarding school, Gunnerkrigg Court. The Gunnerkrigg Court Vol. 5: Refine hardcover arrives in comic book shops on June 17th with a cover by series creator Thomas Siddell (Munchkin) for the price of $26.99 under Diamond Code APR151222. The Final Order Cutoff date for comics retailers is May 25th. Not sure where to find your nearest comic retailer? Use comicshoplocator.com or findacomicshop.com to find one! It’s also available for pre-order directly from boom-studios.com.